As you’ve probably seen, the contact center industry continues to change at an increasing pace. New technology in both customer service and customer communication changes how we think about working in contact centers today. Customers continue to demand superior customer service experiences and can quickly switch to your competitors if they don’t get it. Your employees have options to change jobs as well if they don’t like working at your company, or aren’t happy with how they are treated. 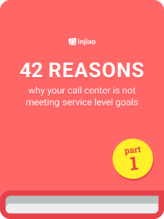 Amongst others, these external and internal factors have an impact on contact center operations and challenge CC professionals to stay up-to-date and flexibly respond to changes and trends in the industry. Yet, when was the last time you assessed your operational performance, or in particular your workforce management strategy? Perhaps you need to think about starting a new workforce management team or reassess your current workforce management approach. Before you do this, make sure you’re clear on what your objectives are. It’s not just “achieve service level”. If it was, our jobs would be really easy (assuming the business funds our plan, but that’s a different issue altogether!). In reality, you’re at the intersection of the financials (labor cost), customer (both service level and you have an impact on customer satisfaction), and the employee (your work plays a huge role in employee engagement). Because of this unique placement, you can touch several different metrics. You should talk to your partners in operations or service delivery and align on your objectives. Take a proactive approach and you initiate the conversation - that is the only way to make a first attempt towards a better goal alignment while gathering valuable feedback in the process. 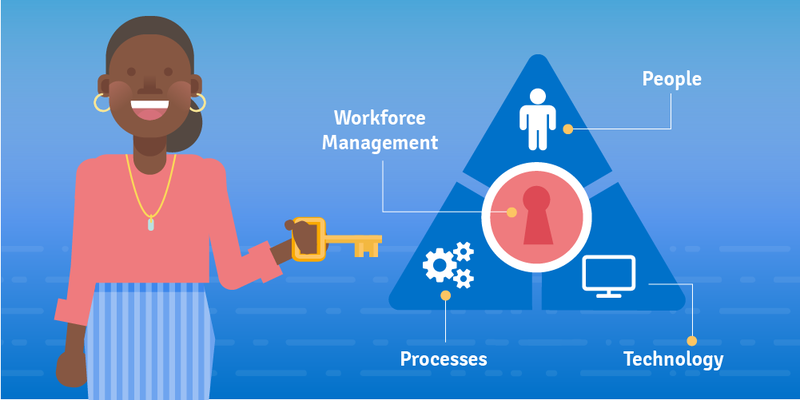 Once you have set your goals set, make sure to consider the following areas when you’re setting up your workforce management strategy. First, figure out how many people you need on the team. There are a lot of benchmarks out there. I often hear people say “1 to 100 ratio of schedulers to agents”. But it’s not actually that easy. Some positions lend themselves to ratios, and other positions have to be sized by either job complexity/number of queues or hours of operation. Every organization has their own nuances, so I don’t like to state numbers as facts, but rather give guidelines to consider. This should be based on the number of queues you’re forecasting for. The more queues you have, the more work it takes a forecaster to plan. Ratios don’t work well here, because it’s the same effort to plan for 50 queues with 5 people as it is to plan for 50 queues with 500 people. >> Also read: 5 forecasting myths you should not fall for. If you benchmark with a company of a similar size, you should look at the number of queues as a modifying factor. If you have the same number of employees as another company, you may need more schedulers if you have more queues to plan, assuming you have your schedulers take action to cover staffing gaps in advance for each queue. >> Learn more about forecasting here. The first criteria here is your hours of operation. Determine the minimum number of real-time analysts you need at open and close to get your baseline. At minimum, you need this number regardless of workload or number of queues. I like doing time-in-motion studies to determine your final number. It’s really like planning a back office function in your contact center. You have work that happens throughout the day, and that has to be actioned within a certain amount of time. If you have high amounts of automation, you may require less effort. One example is fully programming your call routing overflows. If this is 100% done through the ACD, that’s less work for your analysts. Once a month, sit down with your key stakeholders (e.g. Operations Managers or Directors) and review the results of the previous month. Did you achieve service level? What was the forecast accuracy? What opportunities can you surface to drive continuous improvement? Then share the expectations for the next month or next several months. This should drive staffing decisions including recruiting and training. Use this as an opportunity to get everyone aligned. I like 3 weeks here, because it’s within the timeframe where you can take actions. Meet every week with the operations leaders to share what staffing looks like at each interval. Highlight the problem intervals and recommend actions. Log those actions and in the next session the following week, show the updated view and how well they did executing those actions. If you do this, you’ll have looked at each week three times before it happens. There should be a high level of clarity about what is likely to happen, what actions were taken to close gaps, and which risks remain. Expectation setting is critical in workforce management. It’s a best practice to review previous day performance and discuss expected performance for today. This can be just a quick 15 minute touch-base if everything is going well. Here, you’re applying concepts from both of the above processes. Discuss yesterday in the context of how that can help you today. For example, if you had a system go down and it drove up calls, that’s not very helpful if it’s fixed. But if you had high handling times due to a process change, then you need to know if that’s going to continue into today. Then set expectations for what you expect today, using intraday performance reports. If you need anyone to take action, such as break changes, cancelling offline activities, or having agents take different call types, you communicate that here. 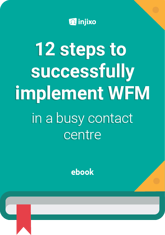 Are your WFM processes aligned to achieve your service level goals? Here's the ultimate checklist to successfully achieve service level. Download the free checklist here! There are a lot of options here. Older, larger workforce management vendors, generally offer hardware and services for sale. Newer workforce management vendors tend to be cloud-based and are easy to set up and maintain. Having the right software is critical to supporting your people and your processes. Your objective is to find solutions that eliminate administrative work so your team can focus on analytical work, as well as the capabilities in forecasting, scheduling and real-time management that you need for those processes. Keep in mind that while your processes may be basic today, as you improve them, you’ll want flexibility in your technology solution to meet your changing needs. --> Learn more about which technologies can help you in the contact center and download the free guide to contact center cloud technologies in 2017. This is just a small sample of what goes into developing a workforce management strategy, but it’s a great place to start. Understand what your stakeholders expect from you. That underpins everything you do, and can be quite different from company to company and leader to leader. The science in what you do is in the core forecasting, scheduling and real-time management. The art in what you do is to align your process outputs to meet the needs of the business. Everything workforce management does should have a measurable impact on the business. And you should be able to promote these outputs and take credit for them!